The separation of image and content is a fundamental tenet of contemporary art, illustrated with work as various as illusionistic trompe l’oeil painting, architectural ornamentation, and the annual harvest of anodized bananas produced by art students across the country. Artists have had at least fifty years to take advantage of the no-touching rule in the gallery or museum space, using a good fake to drive conversations on representative ethics, material use, institutional barriers, and art faith. Is that a carefully cast and meticulously replicated banana, or are we just staring at a banana? Both Letha Wilson and Dave Murray create work concerning the difference between what a thing looks like and what a thing is. 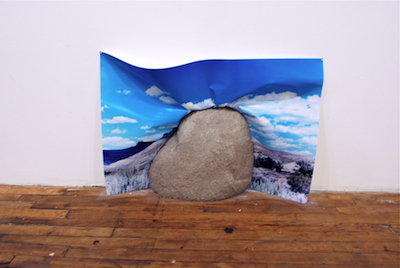 In “This is the same as that,” Wicker Park gallery LVL3’s first show of the fall season, artists Wilson and Murray riff on the notion of material reality in very different ways. Murray’s goofy sculptures are very similar to the work of Christopher Bradley (also a 2010 graduate of the School of the Art Institute of Chicago) whose bronze pretzel sticks and gum constructions are called up closely by Murray’s Pencil Monument, a No.-2 pencil-and-epoxy gum construction. This same labored over-production of absurd objects continues to his mustachioed fake fruit, and is traded for a lazier elegance in his still-life photographs of balloons and houseplants, each costumed into ghosts by a white sheet. While still heavy on irony, these photographs spare the tragedy of production and skip instead to describing representation by slack gesture: all it takes is a sheet with holes for eyes to give a balloon mortal content. 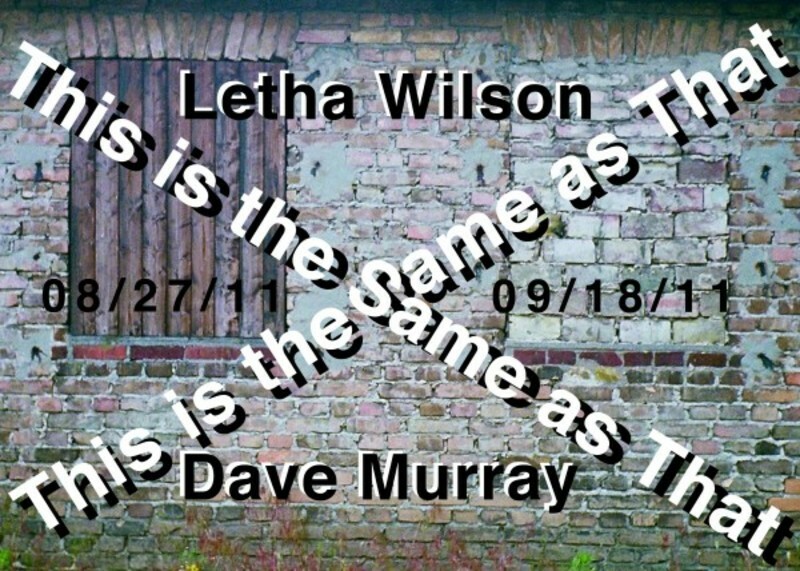 Letha Wilson. Rock Face. Mixed media. Image courtesy of the artist and LVL3. Wilson’s photographs take a very different turn, using photographs and found-object installations to describe the sympathetic relationship to images and real materials. Like Joseph Kosuth’s famous One and Three Chairs (1965), where a real chair was installed beside a photograph of that chair and the printed definition of the word “chair,” Wilson’s sculptures allow for the rare experience of comparing perceptions. For example, Colorado Prop consists of a photograph of three tall evergreens on a hillcrest, but installed high up on the wall by a 2x4 nailed through the front of the photo. Standing in front of it, the viewer cranes her neck to the same angle as if she were the one taking the photograph, linking the space of the gallery and the space of the photographer, and making my initial impression of tallness seem tiny in comparison. Similarly, the flashlight’s beam in Right Back at You gives an otherwise traditional skyscape something more of its real life awe. The effect of these works is very distinct, marking the perceptual import of real objects by physical processes. I’ve never tried to lift a mountain, but I think I know how much that fake rock in Rock Face weighs; and when I look at it, my muscles are calculating its size and weight. Due to the subject of "This is the same as that," note that photo documentation is either insufficient or a trap-door to representative recursion. Actual presence is suggested.